TrustSharePoint: When to Use What in Office 365 + What Can We Share Externally in SharePoint Online? 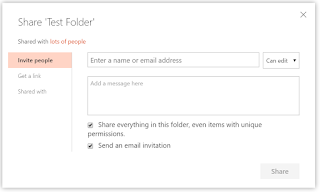 What Can We Share Externally in SharePoint Online? On October 4th I gave a presentation at the Microsoft Technology Center in Houston on When to Use What in Office 365. It was part of a free roundtable seminar series offered by Protiviti. We had a great turn out and a lot of really good questions. Thank you to everyone that came and my sincere apologies for the delay in posting this presentation. I wanted to share my slides with the attendees and anyone that reads my blog, and answer a particularly interesting question that came up during the presentation. Please let me know if you have any questions at all about the presentation. 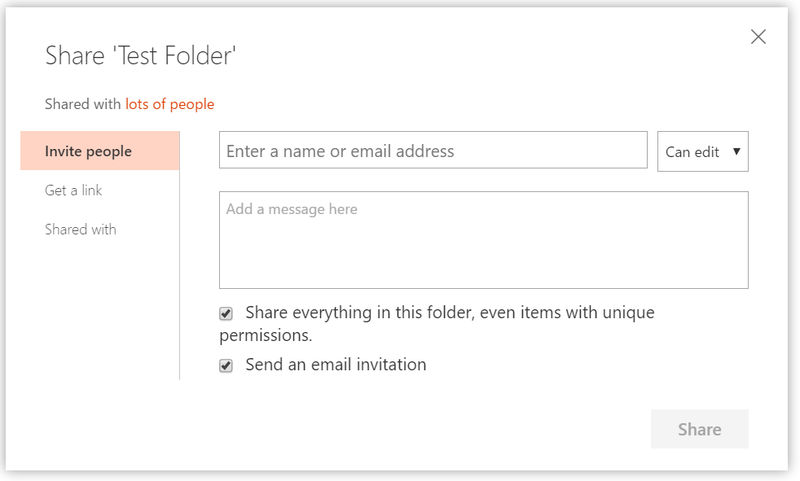 A Question: What Can We Share Externally in SharePoint Online? One of the topics we talked about during the presentation was External Sharing. We covered when to use external sharing and how to use it safely, so that you protect your data from being shared with the wrong people. A great question that came up was can you share libraries, lists or folders externally? Or is external sharing still limited to only sites and documents? I mentioned that only sites and documents could be shared externally, but I was challenged on that so I thought I would double check. The answer is you can also share Folders externally. Libraries and Lists still may not be shared externally. Sites can only be externally shared if you require users to authenticate with a Microsoft account or Office 365 account. This can apply to a site collection or subsite, so you can only share a subsite externally if you choose to. Documents can also be shared externally and require external users to authenticate. Documents can also be shared externally through guest links, which can be used anonymously. 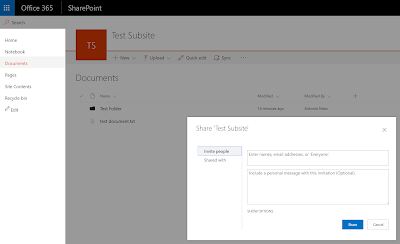 However, this option is only available if permitted by Global Admins and SharePoint Online Admins. 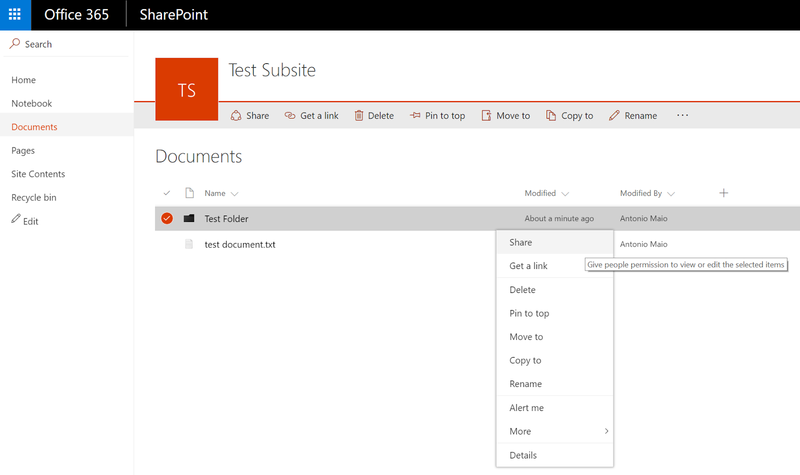 There are controls both in the Office 365 tenant admin center, and in the SharePoint Online admin center which allow you to control the types of sharing permitted. Folders can also be shared externally and require external users to authenticate. Folders can also be shared externally through guest links, which can be used anonymously. Again, this option is only available if permitted by Global Admins and SharePoint Online Admins. This makes sense if you've ever looked at the PowerShell commands available for SharePoint on premise - folders are treated very much like documents in the cmdlets, as opposed to containers. However, you still cannot share a Library or List externally. If you navigate to a library or list, in the Settings page or the Advanced Permissions page for that container, there is no external sharing options available. If you navigate to a List or Library and click Share in the top right menu bar, you get a Sharing dialog but you are in fact sharing the Site - you can see this by the title of the dialog, and any external users that you share with from this point will get access to the entire site. Please let me know if you have any questions about the presentation. However, you still cannot share a Resumeedge review or List externally. If you navigate to a library or list, in the Settings page or the Advanced Permissions page for that container, there is no external sharing options available. If you navigate to a List or Library and click Share in the top right menu bar, you get a Sharing dialog but you are in fact sharing the Site - you can see this by the title of the dialog, and any external users that you share with from this point will get access to the entire site.